Translated by Sister Eraine, Venerable Arynna, and the members of the Ordre of Saint Jérôme and released unto the English speaking faithful, on the 19th day of April 1456. Chapter I The Birth - In which the subject is introduced, and one learns more of the circumstances of the prophet's birth. Chapter II The Revelation - In which Aristotle receives the Word of the Creator. Chapter III - The Soul - In which Aristotle and Epimanos establish that man must have a soul, unlike animals. Chapter IV What Becomes of the Soul - In which Aristotle establishes the future of the soul, that which follows death and the destruction of the flesh, to prepare oneself for today. Chapter V Wandering - In which Aristotle notes that it is not sensible to pray to multiple gods, and that, in all things, unity is preferable to division. Chapter VI The Master - In which Aristotle meets Plato, his professor, and impresses him with his mastery of the syllogism. Chapter VII The Rupture - In which Aristotle breaks with his teacher over the dismal notion that things are copies of the ideas. Chapter VIII The Unity of God - In which Aristotle firmly establishes that God is singular and not multiple. Chapter IX The Nature of the Stars - In which Aristotle congratulates one of his disciples for his insight, because he rightly raised that the stars are divine because of their circular motion. Chapter X Morals - In which Aristotle speaks at length on the distinction between good and evil. Chapter XI The Dream - In which Aristotle dreams of an ideal city. Chapter XII The Hermit - In which Aristotle affirms the social nature of man. Chapter XIII Reception at Polyphilos' - In which Aristotle says it is necessary to know you are surrounded by true friends. Chapter I - The Birth - In which the subject is introduced, and one learns more of the circumstances of the prophet's birth. Harsh is the task of those who would wish to plunge into the abyss of centuries past and search for the words to bring to life in our hearts the heroes of history. If anyone's life deserves to be told, certainly Aristotle's does, for his teachings have illuminated both our life and our death. Here is what I, poor and faithful, intend to relay to you today. If the simplicity of this recitation touches you, and if the noble presence of the wise man reaches your heart, then my work will have made the heavenly powers smile. The life of Aristotle the Wise, Servant of the Almighty, with whom the Divine Word was revealed and who announced the arrival of salvation and the light. During this time, great news spread through the town of Stageira: the wise astronomers had just discovered an unfamiliar comet in the firmament. Immediately, the town assembly gathered in the Agora and tried to discern the message the skies sought to transmit to man. Alas, their hearts were darkened by their erroneous faith in false gods, and they were lead astray by impious suggestions. For one, the comet indicated the arrival of Hermes on winged feet. Another believed the lightning of Zeus would crash down on men and mark the end of time. One man in the assembly kept his silence: his wife would soon give birth, and his anguish prevented him from intervening. He was neither the least wise, nor the least listened to. Nobility and peace registered on his face, as well as the marks of hard labour and a life without softness. The discussions reached their end with no solution emerging, and the man returned home as quickly as possible. There, resting on a leather bed, his wife had just given birth to a son. The man approached his newborn with respect, took him into his arms, and raised him towards the sky, saying, "Celestial powers, I entrust my son to you. Give him a life that is right and just. Keep his heart pure, his intelligence sharp, and his virtue without fault. Let your wisdom guide his steps and his thoughts, so that his life will be like a solid oak tree in whose shade the unhappy will come to rest." Placing the child near his mother, the man knelt close to the bed and remained still for a long time, silently contemplating his wife and his son. Chapter II: The Revelation - In which Aristotle receives the Word of the Creator. One day, the young Aristotle, only five years old, wanted to sit near the temple of the false god Apollo in his village of Stágeira. The temple was on a little hill at the end of the city. The child liked to look at the tall white stone columns that cut across the azure sky. When he approached the steps of the temple, he stopped as if immobilized by an invisible force. Not understanding what had happened, he turned back towards the town to call for his mother, Phaestis, who was some distance from there. However, his lips produced no sound. Terror began to overwhelm his soul, and then a clap of thunder rumbled above the temple to the false god. A flash of lightning struck in its center, and the temple collapsed at the child's feet. Then, a powerful voice that made the skies quiver resounded in Aristotle's heart. It said: "This is what my power holds for the idols that are honored as gods. Seek a single God, search for Truth and Beauty, and then a day will come when everything will be restored." Deeply distressed, the child fell inanimate on the ground. When his eyes reopened, he was in his father's house, and his mother was leaning against him tenderly: "My child, what happened? We found you near the collapsed temple, your face turned towards the sky. Did God appear to you? Who destroyed the temple?" However, the child did not answer. He remained silent and looked at his mother with the eyes of one who sees for the first time. Finally, he spoke: "My dear mother, please tell me: what is the Truth?" The poor woman was good, but alas, her soul was still full of pagan ideas, and she did not know how to respond to this question. She leaned into her son's brow, embraced him, and closed her eyes softly. "I love you my son, isn't that the only thing that matters? Sleep now; tomorrow your father will return from the war, and you must be rested so you can receive him properly." And then she rose and left the room, her spirit filled with anguish. Chapter III - Dialogue on the soul. Part I - In which Aristotle and Epimanos establish that man must have a soul, unlike animals. Aristotle: "Master, how is it that man can think, whereas the animals cannot think at all?" Epimanos: "Who can claim to read the book of nature and extract the secrets of the gods? Aristotle, I tell you this: we cannot know if the animals think. Man thinks, this is certain. However, the animals? Are we in their minds?" Aristotle: "Don't you agree, noble master, that man is forever searching for innovation?" Epimanos: "Yes, certainly, it is rare to see man standing still, satisfied with what he has and what he knows." Aristotle: "Yes, alas, it is very rare, and often I think that it would be better for man to be happy living the simple life of older times. Men search incessantly for new knowledge. But tell me, noble Epimanos, is not man's quest the ultimate proof of his soul and his intelligence? Epimanos: "I see what you are trying to say: if man doesn't search unceasingly, then this would mean that he is content with what he has, that he doesn't innovate, even that he doesn't think. In effect, man's curiosity proves the existence of his spirit." Aristotle: "Indeed, that is what I wish to say. I see clearly that I have nothing to learn from you. Nevertheless, let us continue a little. You have a beautiful dog, I believe? A greyhound? Epimanos: "Yes, a gift from our king for my service during the last war against the Celtic invaders. I am very attached to him." Aristotle: "I understand. How do you train your dog?" Epimanos: "It's very simple: I force him to do something, and when he does it correctly I reward him. And if he does badly, I punish him a little." Aristotle: "Perfect! Once trained, it is always good that you taught him to do this, isn't it? He understands that if he doesn't do what you ask of him, he will not be rewarded." Epimanos: "Indeed. But I don't see where you are going with this." Aristotle: "To this, my master: this dog is so noble and so well-trained that he acts only in accordance with your training. He does not do this of his own initiative, and once trained he is no longer in a position to change. Don't you agree?" Epimanos: "It's true that to change he must be re-trained, and punished when he would have been rewarded in the past. In addition, the poor dog will become crazy. It would be wrong." Aristotle: "Yes. But we didn't we say earlier that it was man's curiosity and ability to invent new things that demonstrates that he has a soul?" Epimanos: "We said that indeed. And if I follow you, this would meant that animals, like my dog, which can't change their behaviour by themselves, don't have a soul as man does." Aristotle: "Exactly! It is therefore established that this is a difference between man and the animals. However, what is it? Do you know?" Epimanos: "No, I'm unaware of it. Do you want to work together to find the answer to this?" Aristotle: "With pleasure! However, not now, because I see that my father is returning from the royal court, and I am in a hurry to hear the palace news. Be well!" Epimanos: "And you, too, my brilliant disciple!" Chapter IV - What Becomes of the Soul (Dialogue on the Soul. Part II:)- In which Aristotle establishes the future of the soul, that which follows death and the destruction of the flesh, to prepare oneself for today. Night fell in the village of Pélla. One could hear the murmurs of women who, near the pagan temples, prayed to the false gods for the king's health. He was, indeed, dying. Nicomachus, Aristotle's father, was at his bedside attempting to soothe him and delay his inevitable demise. Aristotle, who was now 14 years old, wandered through the streets of the town, without seeing or hearing anything that occurred around him. What would happen to him or his father if the king died? Certainly, he would not be held responsible, but who knows what ill-intentioned courtiers would imagine, and what acts of revenge could be enacted in these moments between kings? He stopped near Persephone's temple. He certainly did not believe in the power of these gods, who seemed to him to be no more than dead puppets, but there was almost a secret majesty in this evocation of the goddess of death at the same time. He felt a hand on his shoulder. It was Epimanos. Epimanos: "Are you praying for the King, Aristotle?" Aristotle: "Praying? To whom should I pray? And what should I request?" Epimanos: "What do you want to request? That he should live, of course! And if you don't believe in this goddess, don't you believe in a superior force who governs our life?" Aristotle: "That he should live? He is going to die, you know that as well as I do. Our prayers cannot return his youth or his health. He has lived a long time, and it is time for him to leave. No, if I pray, it's won't be for him to live." Aristotle: "What happens after life, Epimanos? This unique soul that man possesses and which differentiates us from the animals, does it survive after life?" Epimanos: "I don't know, Aristotle. My science rests on life and not on death. I can tell you how to live well, how to be happy, and how to understand everyday life, but not what occurs after death." Aristotle: "You can tell me how to live well? Let us see that. Don't you agree that to act intelligently, it's necessary to know in advance the consequences?" Epimanos: "Yes, of course, this helps you avoid making mistakes, acting badly, or prejudging the situation. It's important to anticipate the outcome." Aristotle: "Yes, that's what you taught me when I was younger. However, if that is right, let us take an example: let us imagine that you want to get married. Do you agree that it's a final commitment, and that you must choose well?" Epimanos: "Certainly! Our laws don't anticipate divorce, and I believe that those who want to get married will regulate their actions to make the marriage a happy one, otherwise it would be true madness!" Aristotle: "You think as I do that marriage prepares one even before one takes the serious commitment: one tries to correct his defects, to make himself pleasant and good, so that everything is better by the wedding day." Epimanos: "If everyone took this advice, there would be more happy marriages, but I think that it's necessary to do this in most cases." Aristotle: "I'm happy that we agree. Therefore, to live well we must know what happens after death." Epimanos: "Oh!? I do not follow you anymore. What are you trying to say?" Aristotle: "It's very simple: just like marriage, death is a final event. We must prepare ourselves carefully. If there is life after death, then the life we live before death must be devoted to preparing for life after death. Just as we must spend the time before marriage preparing for married life." Epimanos: "I see where you want to go. For you, death is just a passage to another life?" Aristotle: "Yes, and our present life must be devoted to preparing for this future life." Epimanos: "But why is this future life more important than the present? And how can you be sure that it exists?" Aristotle: "Do you remember our discussion about the difference between animals and humans?" Epimanos: "Yes, I remember it very well. You said that there is a difference between the two, that man is intelligent while the beast never searches for anything new." Aristotle: "Yes. However, how does he search for newness, to create new things both in him and around him? Epimanos: "Well, if I speak from my own experience, I can say that the ideas came to me and didn't seem to come to anyone else, and that I meditated on these ideas." Aristotle: "Yes, immaterial. It wasn't the result of a noticeable effect but rather of an immaterial or spiritual impression." Epimanos: "I understand. Nevertheless, what conclusions can we draw from this? Evidently these impressions from the soul." Aristotle: "Yes, but that would mean that the soul is immaterial, but the immaterial cannot come from the material. Nothing can give something it does not have. Don't you agree?" Epimanos: "Yes, said like that it makes sense. However, where do you want to go with this? Aristotle: "My father is a doctor, Epimanos, and he often describes death to me: matter decomposes and disintegrates over time. And look around you: death is always marked by the destruction of matter." Epimanos: "Yes, everything passes through this world, and that which the ancients constructed is already nearly gone." Aristotle: "But if you take something which is not composed of matter, does it also disappear? Epimanos: "It does not seem so to me: if it isn't composed of matter, then it cannot disintegrate. It cannot die. In this way, the thoughts of a man like Pythagoras will be eternal and will still be alive in more than a thousand years." Aristotle: "Therefore, you think that the immaterial doesn't die?" Epimanos: "With everything we've said up until now, I believe that has been established." And with these words, the two friends parted. Epimanos returned to Persephone's temple, while Aristotle headed towards the city gate to retreat into the countryside. Chapter V - Wandering - In which Aristotle notes that it is not sensible to pray to multiple gods, and that, in all things, unity is preferable to division. When Aristotle was fifteen years old, he lost his father and mother and was entrusted to the supervision of his nearest relative, Proxène, who lived in a remote region between Stageira and Athens. The young orphan was educated through harsh work of the land. This hardly satisfied him, because he was convinced that his spirit was more capable than his hands. He often met the humble peasants who worked with Proxène. He certainly admired their taste for the simple life, far removed from the sumptuous splendors and luxuries, which, he sensed, led clearly to vices. However, Aristotle was astonished by their customs. One day, he saw one of them confiding in a prayer. Aristotle remembered his last dialogue with Epimanos, and found the peasant at fault. Aristotle: "To whom do you address your prayers, good man?" The peasant: "To the gods, my young friend." Aristotle: "To the gods? But who are they?" The peasant: "They are Aphrodite, Apollo, Ares, Artemis, Athena, Demeter, Dionysus, Hades, Hera, Hermes, Hephaestus, Poseidon, and the most important of all, Zeus. Each sits at Mount Olympus." Aristotle: "Where is this Olympus?" The peasant: "It's a marvelous city perched on top of a mountain that no one has been able to conquer. Have you seen Mount Athos? Olympus is a hundred or a thousand times higher, un truc de genre." Aristotle: "Have you ever even tried to climb this mountain? Aren't you curious to see with your own eyes these divinities to which you pray every day?" The peasant: "Oh no, young man. I am just a humble peasant. My place is here, not on Olympus." Aristotle: "But then, how can you believe in the reality of these gods, if you haven't witnessed their existence for yourself?" The peasant: "Because I was taught that they exist, and that I must pray to them for a better harvest and so that my cows would become fatty." Aristotle: "This is strange, you don't pray out of love for the Divine, but for your worldly hungers. I think that it is irrational to seek the material from the spiritual. But to speak truthfully, that is not the only thing I find irrational in what you have said." The peasant: "So you still reproach me?" Aristotle: "Well, there is one thing that I don't understand: why pray to multiple gods?" The peasant: "As I told you, this was taught to me, that there are several and that it has been so since the dawn of time." Aristotle: "This complicates matters unnecessarily. Instead of multiple divinities, isn't it more practical to praise only one?" The peasant: "You're beginning to wind me up, young traveler. Can I ask you some questions? I will ask you if you wear short pants or trousers? Now, leave me to my meditations." Aristotle: "No, no, I will do nothing of the sort. You must first admit, good man, that praying to a single god is more logical. What do you expect from a god if not that it is all-powerful and omniscient? To return thanks to many gods is to fragment into parts the power that only one could unite in him. I believe that in all things, unity is preferable to division." Aristotle: "No, certainly. The divine one is a single Whole, and the divine one is perfection, therefore perfection is united. Unity is the ideal form of things." The peasant: "Okay, stop young man, I am far too stupid to listen to your nonsense. I am far from being a well-read man. If I give you advice, will you leave me in peace?" Aristotle: "Well, yes, that works for me." The peasant: "Take the road to Athens, if Proxène will allow you, and find there a professor who will be able to listen to you. His name is Plato." Aristotle: "Thank you, good man." After his eighteenth spring had passed, Proxène sent Aristotle to Athens. The poor peasant was all too happy to see him go. Chapter VI - The Master - In which Aristotle meets Plato, his professor, and impresses him with his mastery of the syllogism. Aristotle, after several days of an exhausting voyage, finally entered Athens. What he saw there left him flabbergasted. The city was marvelous, and the architecture had a superb purity. The colonnades were distributed in a harmony that lifted the spirit. On each street corner, sprawling markets attested to the formidable commercial activity that occurred in these parts. The gardens were numerous, and there one could see little groups of philosophers contemplating sophisms amid the luxurious plants, the charming fountains, and thousand-year-old stones. A splendid temple, perched on a plateau, dominated the city. Aristotle was very impressed, and he eventually found the academy where the famous Plato taught. The magnificence of the place overwhelmed him, and, as if in a hallucination, he wandered the immense marble hallways of the building. His steps led him towards a heavy door on which one could read an inscription, "Schooling, Second Cycle." Aristotle had never seen anything like it asked himself what this mysterious formulation could mean, but he decided to enter to ask for directions. The reception he received was extremely unpleasant. A disagreeable old woman informed Aristotle with pursed lips that "Professor Plato must give a third year course at the end of the hallway on the right, then a left, then two more rights, then a left, then straight, then at the top of staircase B." Finally, one of the women made Aristotle understand, with a dark stare, that he should leave the room at once. After more travels and scornful looks from the students from whom he asked directions, Aristotle finally arrived in a large amphitheater where the professor noticed his intrusion. Plato: "What is your name, young man?" Plato: "Very well. Aristotle, know that I do not accept anyone into my course that I haven't tested first." Plato. "Well, then. 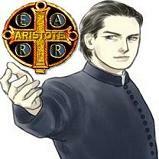 Aristotle, if I admit you into my school, I will teach you rudimentary logic, and more if your intelligence permits it. But first, you must know how to detach yourself from that which you consider certain. A good philosopher is confident only in his own reason and must be capable of dismantling the perverse reasoning of the sophists to have a perfect knowledge of things in the world. Listen to this well: it should be said that no cat has eight tails, but a cat has one more tail than no cat. Therefore, a cat must have nine tails." Plato: "Okay, can you demonstrate the absurdity of this sophism?" Aristotle: "Well, let's continue with the reasoning. A cat must have nine tails, therefore a cat has nine tails more than no cat. And since no cat has eight tails, a cat must have seventeen of them..."
Aristotle: "If one turns the reasoning into a loop, it begins to contradict itself. The statement that comes from the conclusion must therefore be false." Plato: "That's remarkable, young man. I see that it isn't necessary to teach you the art of syllogism, it is innate in you." And Aristotle was happy to have satisfied his new professor. Chapter VII - The Rupture - In which Aristotle breaks with his teacher over the dismal notion that things are copies of the ideas. Aristotle eagerly followed Plato's teachings. Everything the teacher said, the student absorbed as if it were unquestionably true. Aristotle's abilities made him Plato's favored disciple, and when the teacher stated a principle, the student always found the means to ensure its exactitude, by well-conceived reflections or examples. Plato: "Thus, ideas are an abstract creation of our intellect. They have an existence which is clear for them." Aristotle: "You want to say, teacher that things don't exist as much as ideas?" Plato: "Yes, that's what I want to say, brilliant disciple." Aristotle: "But, consequently, you claim that things exist without an idea being present, and vice versa." Plato: "Indeed, the idea is a product of the conscience, and things are products of reality. It's advisable to distinguish between these two objects." Aristotle: "It's a strange proposition, dear teacher, to dissociate that which is undoubtedly dependent." Plato: "What are you saying?" Aristotle: "And also an idea can't exist without that to which it refers." Plato: "But what do you make of abstraction, Aristotle?" Aristotle: "Abstraction is an illusion, dear teacher. Ideas do not come to the mind unless there is the thing. We started from a whole, and if an element become intelligent that's so because it exists." Plato: "But with such an assertion, you deny the creative power of the spirit." Aristotle: "The spirit does nothing but observes and note. Ideas are only the ability of man to see that which surrounds him. They only make the essence of things intelligible. Moreover, by extension, things, which are intelligible to man, are only a copy of the ideas that made them. Nothing exists apart from intelligibility." Consequently, the rupture divided the teacher and his disciple. Aristotle, whose respect for Plato remained intact until he passed away, made the decision to become free of his professor and left Athens. Chapter VIII - The Unity of God - In which Aristotle firmly establishes that God is singular and not multiple. Aristotle, who was at the age of his philosophical maturity and emancipated from the supervision of his teacher, decided that it was time for him to found his own school. He knew that Hermias, his longtime friend and lord of Atarneus, had reunited a small coterie of academy alumni from Athens to Axos, on the coast of Troad. Thus, Aristotle decided to direct their teaching and founded his first school. Aristotle's academy was a great success. Students from all of Greece flowed there to be enlightened by the teacher. However, one beautiful day in spring, a promising disciple came to find Aristotle. The disciple: "Teacher, I thought so much, to the point of not sleeping, but this question has always tapped my youthful spirit." Aristotle: "I'm listening. Tell me what worries you." The disciple: "Well, teacher, you taught us that the universe is dynamic--you taught us that if the essence is static, the form is moving like a wave on the water's surface." The disciple: "But teacher, according to this principle, every act corresponds to a power, as you say it yourself, and therefore, every effect corresponds to a cause." The disciple: "Then, teacher, if I reexamine the order of effects and causes, I shouldn't find one cause for every effect. Alternatively, with all due respect, it is widely known that there are multiple gods. Thus, according to your theorem, the world should be only chaos because right from the start, the cause are multiple and do not work together by will. Unless you are postulating that all the gods are only the effects of one, powerful over all. Can you enlighten me? Aristotle: "But, dear disciple, the solution is found in the statement of the problem. Reason a little, my friend. Stick to the principles of the dialectic and the syllogism. In your statement, there is an exogenous element, a parasite, namely that which you assert as a knowing public. I have always told you, we are the philosophers, and one can only reach the truth through the work of our minds that describes the substance, not by treating some postulates as cash." The disciple: "What are you trying to say, teacher?" Aristotle: "I want to say that if you examine the order of causes and effects, you will find the final cause, pure intelligence, as you say. Therefore, if it is well known that there are several gods, it is no less false, because such an affirmation does not withstand the logical examination of the proposition. The disciple: "Erm, could you be more clear, teacher?" Aristotle: "Certainly I can, with this childish syllogism: a final cause is pure intelligence, a divinity. If on examines the order of causes and effects, one only finds a single final cause. Therefore, God is singular." The disciple: "Oh, bah, that then!" Aristotle: "I won't make you say it, dear disciple. There is only one God, the motionless mover of the world [this is usually translated as "prime mover unmoved"], the perfect will which is the source of any substance, of all movement. God is the cosmic finality of the universe." Chapter IX - The Nature of the Stars - In which Aristotle congratulates one of his disciples for his insight, because he rightly raised that the stars are divine because of their circular motion. On a day without clouds, Aristotle had invited his disciples to admire the vault of heaven. All of them were filled with wonder at the beauty of the stars, shining like torches on the inky sky. The teacher showed his students that the stars move in patterns. However, some of the students became cold and wanted to return home to sleep. Sargas: "Teacher, wouldn't it be more beneficial for us to discuss and study rather than to laze around outside?" Aristotle: "Ah, so you think that we are being lazy. Don't you believe that the celestial spheres are the most perfect things that exist?" Aristotle: "Tell me, how do the stars move? Sargas: "Teacher, they move in circles, fixed as they are on transparent, crystalline spheres." Aristotle: "Okay, and the Earth, what is its form?" Sargas: "The observation of the stars during a voyage or of a boat on the horizon shows us that the Earth is round." Aristotle: "So you've listened faithfully to my lessons. The Earth is spherical, and the sky is composed of spheres supporting the stars. Circles and circular movements are everywhere. Now, what movement is more perfect than circular movement?" Sargas: "None, teacher, because it's sufficient for itself and translates as continuity. Circular movement is a most excellent and perfect movement." Aristotle: "Now, a perfect movement can only be produced by a perfect power. And the only perfect power is God! Dear disciples, the observation of the skies enables us to understand how well laid out the celestial spheres are. And this perfection carries the mark of God." Sargas: "You are right, teacher, and thank you for this lesson." Aristotle: "Don't thank me, thank the stars. There, take these notes and go look for a little wine for us at Oinos' house." Sargas: "I'll run there, master." Sargas returns with wine for all the disciples, and they remain there a moment longer to contemplate the stars. Chapter X - Morals - In which Aristotle speaks at length on the distinction between good and evil. On a harsh winter day, a disciple, who had reached the end of his education, came to find Aristotle before leaving the school. The disciple: "Dear teacher, now that I will be left to my own devices, there is one thing I would love to know." Aristotle: "I'm listening, brilliant disciple." The disciple: "You have trained me well in the art of logic and the metaphysical sciences, but you have said nothing to me about morals." Aristotle: "You speak the truth, my friend. It is indeed a gap in my teaching. What would you like to know?" The disciple: "It's important for a man, I believe, to know how to identify good and evil, in order to conform to the first and be able to avoid the second." The disciple: "This brings me to a simple question, teacher, what is good?" Aristotle: "That problem is at the same time vast and simple, like a crystal. The good, in principle, is the natural perfection of an object, of its substance. The disciple: "But why is it thus, dear teacher?" Aristotle: "Because the ultimate good resides in the divine, without any doubt. Moreover, to identify the good, it is sufficient to examine the essence of the divine. The nature of the All Powerful is pure and perfect intelligence, the good can only be the perfection of the substance, and therefore the nature of a thing. Do you understand?" The disciple: "Yes, dear teacher, I understand." Aristotle: "I have taught you, dear disciple, that the nature of a thing lays in its destination, since the movement reveals the substance of the object. Therefore, you know what the nature of man is, don't you?" The disciple: "Certainly, teacher, the nature of man is to live in a community, and this community is called a city." Aristotle: "Exactly. The good of man, which is to say that which makes him achieve the perfection of his own nature, is thus a life dedicated to ensuring harmonious conditions within the city. Now, the good of the city is all that all contribute to its equilibrium, so that the nature of the community is perpetuated. Therefore, you could say that the good of man leads to the good of the city." Aristotle: "Indeed, that it is. You see, man does good only by being fully integrated into the city, by participating in the life of the city, and by doing all that is possible to maintain harmony." The disciple: "Then, dear teacher, the good man is therefore a citizen?" Aristotle: "I didn't say that, dear disciple. A slave can be a good man, if he is aware of his own human nature, and if he is satisfied with his condition because he works to maintain the equilibrium of the city. Participating in city life is more than just participation in assemblies." The disciple: "Well, dear teacher, these answers satisfy me." Aristotle: "I am happy, my friend." And, with that, Aristotle never again saw his disciple who, according to the legends, lived an exemplary life, inspired by virtuous principles. Chapter XI - The Dream - In which Aristotle dreams of an ideal city. Aristotle: "Last night, my dear disciple, I had a dream." Sargas: "Really, teacher? Tell me about it." Aristotle: "Certainly. I dreamed that in the East a marvelous city existed. Sargas: "What kind of city?" Aristotle: "An ideal, perfect city where everyone lives in a fabulous harmony. The equilibrium there is so solid that no one can break it, not even foreign arrivals such as I was in my imagination. I intruded there, importing my morals, which I would now say are corrupted, but they welcomed me there like a brother." Sargas: "What were its principles, teacher?" Aristotle: "The city was organized according to the principle of three concentric circles, or three classes of citizens if you prefer. I will begin by describing for you that which will constitute the lowest of these classes, namely the producers, or the bronze class. They comprise the majority, and they live peaceably in the culture of their fields and the breeding of their animals. They take that which is necessary for their subsistence and that of their families from their own production, and gave the remainder to the higher classes. Even if these men constitute the base of the city, their condition is somehow enviable. They know the joys of tranquility and a simple life in service to the community. They are devoted to physical activity required of regular work, and this keeps their bodies well-conditioned. They fill their spare time by contemplating nature, educating their children who are prized by this class, and for prayer, they praise God for giving them the pleasures from which they benefit. The second class of citizens, the silver class, is that of the guards and soldiers. They are authorised with idleness and profit in times of peace and enjoy free subsistence provided to them by the producers. They philosophize, admire also the benefits of nature, educate themselves according to their age, and are involved with the handling of weapons. In times of war, they are the most enthusiastic defenders of the city. Their courage has no equal, and they would give their life, without hesitation, to preserve the community or to defend their faith, which they hold in very high esteem. Upon their return from battle, they are treated as heroes. Their heads are wreathed with laurels, they are treated like princes, and fabulous feasts are held in their honor. They are carried about triumphantly by the people and are loved by the women. The third class of citizens is that of the philosopher kings, the golden class. These are the oldest people, recruited from among the guards who demonstrated the most bravery, the best commanders, and the most gifted philosophers. Their only good is reason, because they are freed of their earthly possessions. Their faith in God is their only weapon. They are famous for their most perfect practice of the virtues. They are an example for everyone, and the people are happy to sacrifice a portion of their property to assure the survival of these masters. The philosopher kings constitute the government of the city. They determine its fate in an assembly. They are also the ministers of religion restored to the Almighty, and there resides their legitimacy. In their positions of power, the Almighty advises them. They keep their power as advised by the Almighty, sharing their condition with the priests. They organize the whole city, plan production, return justice, and legislate." Sargas: "By my faith, that's a formidable city that you've described to me." Aristotle: "Certainly, that's true. And I have a personal belief that it must exist, somewhere." Sargas: "You believe so, teacher? Isn't this a simple dream?" Aristotle: "No, I believe that it's a premonition. And I want to assure myself of that. I have spent my time here, and it is time for you to transform from a student into the teacher. The college belongs to you." Sargas: "How, master? But I still have so much to learn." Aristotle: "Not from me, my dear friend." Chapter XII - The Hermit - In which Aristotle affirms the social nature of man. Aristotle walked on to Attica after visiting a distant relative in Thebes. He was alone, having handed his responsibilities to the school to his best students. However, at an intersection, he took the wrong path and instead of heading down into the plains and the city, he climbed upwards into the hills. After walking for two hours, he realized his error and noticed an isolated dwelling. He decided to go there to ask for directions. As he approached, he realized that what had looked like a house from afar was actually a primitive hut leaning against the rocks, coarsely masking the entrance to a cave. He knocked on the door and, eventually, someone opened it. The old man was dressed simply in rags that barely covered him. He was thin and hairy. Aristotle: "Hello, old man. I am lost and looking for the way to Megara." Hermit: "If you go there, you will be lost." Aristotle: "I don't remember the town at all or the roads in these parts, which are occupied by brigands by now." Hermit: "So what if there are brigands. Humans populate the roads. That's dangerous enough." Aristotle understood then that he was dealing with a hermit. Aristotle: "Tell me, are you happy?" Hermit: "Am I happy? And how! I have all that I need: water from the river, the olive trees, and a little garden. In addition, my hands are not deformed, so I make everything that I need. I do not need anything or anyone. I am perfectly happy." Aristotle: "A man cannot be satisfied with such a life. At least not fully." Hermit: "Nonsense! I am the best of men." Aristotle: "How would you know it, you who do not know any others? To be human is to live according to the virtues. Moreover, the virtues are practices that can only be expressed with other people. You live well, certainly, but you practice none of the virtues since there is no one with whom you can practice. You live independently, like a bear. However, has anyone seen a bear being virtuous? You are not a happy man because you are not even human. A human has friends, where are yours?" Hermit: "My friends are nature, my olive trees, and my vegetables." Aristotle: "A true friendship occurs between equals. You are thus equal to an olive tree: planted and motionless. You survive on the margins of the city, instead of taking part in it like a true human. I will leave you to take root, farewell!" And Aristotle returned to the road, descending towards Megara. Chapter XIII - Reception at Polyphilos' - In which Aristotle says it is necessary to know you are surrounded by true friends. Aristotle was invited to a reception at the home of a rich Athenian merchant who served also as an archon. His name was Polyphilos. He was a very rich and powerful man and passionate about philosophy. He often came to listen to Aristotle, as often as his responsibilities and burdens permitted him. His house was completely full, and the tables were crowded with food. Aristotle held a cask of wine that had just been filled to the brim. He had just taken a stuffed grape leaf when Polyphilos approached him. Polyphilos: "Aristotle, dear teacher. How do you find this reception?" Aristotle: "I admit that I prefer smaller gatherings, you can't listen here. Nevertheless, your house is splendid and the banquet is worthy of the greatest kings. Polyphilos: "Thank you for these compliments. But nothing is too good for my friends, and I love to have them all around me." Aristotle: "All of these people here are your friends?" Polyphilos: "Of course. No one but my friends may enter here." Aristotle: "I see here people of all social extractions who serve the city in a wide range of functions." Polyphilos: "And so? I am not haughty. I leave that to the nouveau riche." Aristotle: "Certainly, it speaks to your honor. However, it cannot possibly be true friendship. A true friend is an equal because friendship must be perfectly reciprocal and equitable. Otherwise, this is not a friendship but more like profit-sharing. A king can expect nothing from a beggar, the latter is incapable of aiding him in times of need, and mutual aid is the basis of friendship. Therefore, friendship is not possible between people who are too unequal. Eumónos: "I'm always telling my father--these people are not his friends, and he must keep his distance." Aristotle: "That would be the opposite mistake, young man. Friendship is man's greatest good. It establishes community bonds, and, in turn, communities form the City. Friendship permits social relations, and man can then take part in city affairs. And, as the primary virtue of man is participation in the city, friendship is essential." Eumónos: "But how do you find perfect equality?" Aristotle: "It's not necessary. It is only necessary that the profit-sharing be not too pronounced in the dominant friend. The happy medium, that of virtue, is to know that you are surrounded by true friends, by people who can count on you and on whom you can count." Polyphilos and Eumónos nodded in agreement. Aristotle stepped away a bit, and then returned. Aristotle: "These grape leaves are delicious, as delicious as a friend's council, don't you think?" Aristotle was in the twilight of his life. His reputation crossed the seas that bordered Hellas. More and more, the old teacher likes to walk in the countryside near Athens. One day, when he had walked through the western gate, he noticed a group of young people sitting in a garden. One of them was standing under an olive tree, and he seemed to be leading the discussion. If old age had weakened Aristotle's body, his spirit and curiosity were still as sharp as the blade of a scythe. He approached the group. He realized then that they were speaking about philosophy. A young person: "O Epicurus, tell us about the Gods." Epicurus: "What is God, if not a perfect being, and therefore a perfectly happy being. Moreover, they are perfect, they are incorruptible, and therefore their happiness is eternal. In addition, why would the Gods concern themselves with us? We should ignore the Gods because they have no interest for our little affairs." And then, as everyone turned to see who had said these words, Aristotle approached, examined a stone and sat down. Epicurus: "You don't agree with what I've said?" Aristotle: "How could I, when it's false? You say that the Gods are perfect, right. However, think about what perfection is. Perfection is not only physical, it is also moral. God must be perfectly moral, therefore virtuous, and therefore good." Epicurus: "But it matters little if he is good. He is so perfect that he isn't concerned with us." Aristotle: "On the contrary, his perfection obliges him to be concerned with everything, otherwise he would miss something and then he would be imperfect. And then, you speak of the Gods, but there is only one. How could a perfect being exist alongside another? At the same time, if he perfect, he is unique because all perfection foreign to him could only cut him off." Epicurus: "Singularity can't create multiplicity. If your perfect being exists, nothing can exist at its side." Aristotle: "The argument is beautiful, but it is useless because obviously we exist, and evidently God exists. More than that, I would say that our existence proves God's existence. Every effect has a cause. Existence itself must have a cause, and that cause also has a cause... If you want to avoid an infinite regression, it is necessary to postulate an initial cause. What else could this cause be but a perfect being with neither beginning nor end? This initial cause is the source of all the causes. This discussion, moreover, has several causes." Aristotle: "So, you are less narrow-minded than I thought. Listen then to the other causes of our discussion. The material cause, that is you, because you are here, and your remarks provoked this discussion. You are the raw material. The efficient cause, that is I, because it was me who instilled in you a little wisdom. I am the artist. The formal cause, which is the dialectic, which you still must learn to master. It is an artistic technique. And the final cause, that is the truth, which was implanted in your soul. It's the finished work." This young man will go far. His ideas are likely to spread quickly. Let us hope that others will come who will continue my work and track this line of thought.